Early this morning, May 12, a 7.3 magnitude-earthquake struck Nepal between Kathmandu and Everest, near Namche Bazaar, The Associated Press reports. This is the largest tremor to strike the region since the April 25 quake. Last month's 7.8 earthquake, with an epicenter in Bharatpur, Nepal, destroyed entire villages, left more than 8,150 people dead and 17,860 injured. That quake was the strongest one to hit the country since 1934, creating widespread destruction that left hundreds of thousands of Nepalese people homeless. Now a new tremor has resulted in more than 50 deaths and 1,261 injuries, states CNN. Additionally, it leveled a four-story building in Kathmandu, caused landslides and weakened a dam near the district of Dolakha threatening thousands with potential flooding, The Guardian notes. Today's earthquake, with an epicenter located 47 miles from Kathmandu, near Banepa, Nepal, collapsed and further damaged buildings that had been weakened by the April 25 quake. Severe destruction was reported in the Sindhupalchok and Dolakha regions northeast of Kathmandu. At least eight people died in Sindhupalchok and more than 100 are injured, in the region where 2,600 people died in last month's quake. Nineteen people died in the district of Dolakha and it "appears to be the worst hit," The Guardian reported a national police spokesman as saying. The Guardian notes that conflicting casualty figures have come in regarding this remote, rural area. There have been fourteen additional aftershocks, as of press time, Earthquake Track states. In the past 100 years, six magnitude 6 or greater tremors shook Nepal within 150 miles of the recent quakes. Before last month's tremor, the largest magnitude earthquake was an 8 in 1934, killing 10,600 people. In August 1988, a 6.9 quake resulted in 1,500 deaths, says the US Geological Survey. "This area [is] one of the most seismically hazardous regions on Earth," they state. 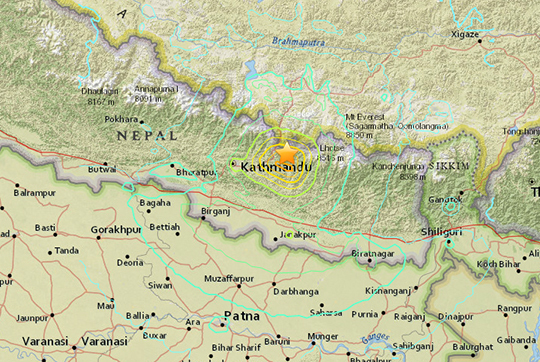 Nepal has experienced fifteen earthquakes today, twenty-four this week, and 95 this past month.